In the early 1990's, Mr. Li Hongzhi (respectfully referred to as "Master" or "Teacher" by His students) embarked on the auspicious goal of imparting the great teachings of Falun Dafa to the world. Falun Dafa, also known as Falun Gong, is a practice of what the Chinese call "self-cultivation." Falun Dafa students perform slow-moving, graceful exercises and, more importantly, apply the principles of Truth, Compassion, and Forbearance to their daily lives. Starting in 1992, Master Li travelled all over China for more than two years, giving over fifty series of lectures on the practice in cities throughout the country. The classes were the most inexpensive of their type in the country, but what students received was priceless--they gained a true cultivation practice that went far beyond the realm of just keeping healthy and fit. Master Li participated in the 1992 and 1993 Oriental Health Expos in Beijing, earning several awards. Students quickly found that during the course of the lecture series, their bodies were being purified, reaching a state of optimum health. This initial benefit led many to seriously look into the practice, accounting for its extremely rapid growth. By 1998, over 100 million people had embraced the practice in China alone. Currently, Falun Dafa is practised in over 60 countries around the world. In the course of Master Li's selfless effort to spread the practice, many could see that He was no ordinary qigong master--He genuinely exemplified the greatness of the practice. Master Li was truly guiding people to higher realms of awareness. Because of this, millions completely regained their health and attained deeper understandings of what it means to be human and how to upgrade themselves to live virtuous and dignified lives, filled with compassion for all. Practitioners nobly facing the unprecedented brutality of persecution in China over the past five years have demonstrated these improvements in character. The greatness of Falun Dafa and its practitioners has been recognized around the world: Master Li Hongzhi and Falun Dafa have received over 1,400 recognitions and awards, and Master Li has been nominated three times for the Nobel Peace Prize. This book is a compilation of recollections of the early years when Falun Dafa was first taught in China. 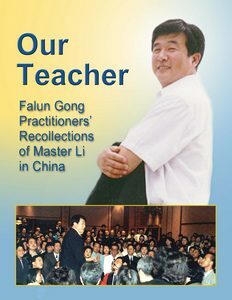 In these essays, students of the practice recall the lectures, their interactions in various situations with Master Li, and some of their personal experiences with Falun Dafa. All of the narratives in this book are true, personal accounts, and they will serve as a record of that precious period of history--history that is increasingly being recognized for the great impact it is having on the world.